Kosala Perera of Hemas Holdings PLC won the award for the Best Swashakthi Memberat the Swashakthi Abhimani National Awards Ceremony organised by the Ministry of Social Welfare and Primary Industries. Organised in collaboration with the Department of Social Services, the objective of the Swashakthi Abhimani National Awards is to evaluate and recognise institutions that provide employment to disabled persons and skills development centres that develops theirskills. 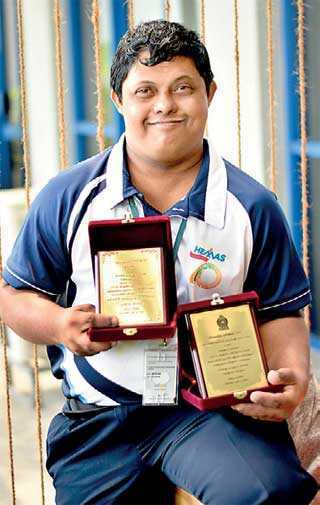 Born with Down syndrome, Kosala at 33 has a winning smile and a positive attitude to life. He is an empowered individual who has not let his disability get in the way of his development and has worked hard to ensure he becomes a valued team member at Hemas. Kosala has many talents to his credit, he is an award-winning Oriental dancer and an artistwithan innate ability to mix and match colours. Playing a vital role in his progress is Kosala’s mother Sunitha Perera who is a teacher for children with special needs. Sunitha has worked hard to ensure that Kosala’s disability does not stand in the way of his development and integration to the society. “I was 38 years old when I had Kosala, and I am very fortunate to have him in my life. When I realised he was special, my only goal was to make him independent and give him the right skills. I am very thankful to Hemas for giving my son an opportunity to shine and appreciate the way he is being treated. Working atHemas played a key role in uplifting the living and social standing of our family. Working for a large organisation like Hemas has helped Kosala be respected and accepted within the society we live in.” said Sunitha. “We are an equal opportunity employer and are proud to be a part of Kosala’s journey and recognise the progress he has made in a short span of time” said Hemas HoldingsGroup Sustainability and Corporate Communications General Manager Shiromi Masakorala.